Before starting the document, my first step was to draw a plan. I shall include on here what I did, and why I did it. I planned to start with a short introduction, because it was necessary to explain what they flyer was for. However, since everything I'd researched would be put under its own section, I didn't want to make it too detailed or longwinded; just long enough for someone reading it to want to read on. After the introduction would come a picture. This picture would be a colourful one, so that the first glimpse they got of the page would be eye-catching, rather than just a paragraph of information that could scare a younger reader off. The first section was on rights and responsibilities. I thought the best way of presenting these would be as two bullet-pointed lists: one of different rights, and one of their corresponding responsibilities. This was less intimidating and easier to read than a big paragraph, so I thought it would be a good way to format it. After this I planned to have a story about Cyberbullying, as a way of introducing people to the topic and getting their attention. Some of them are very tragic-- I would try not to make it too traumatising for a slightly younger child, but they do really need to know fully the dangers of the internet, and they would get this better from a real-life story than from lists and graphs. Then I would add another picture to make it more visually appealing. After this would come another section (which I thought I would probably cover in bullet points, since they're easy to read) on what to avoid online. They would probably be more interested in this if they had already heard of the dangers involved, which was why I had decided to set it out in this format. After this would come my information on changing privacy settings, since this tied in nicely with what to avoid. I could set this out in a step-by-step guide to help someone who needed to do it. My next picture would be a screenshot. 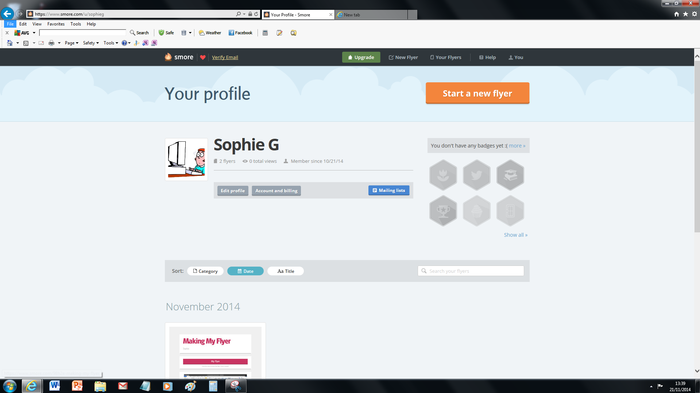 This would help illustrate the profiles paragraph, and would help me to get my point across, as well as making it look better and more interesting. Next I hoped to vary the format slightly; this would make it more interesting. Instead of going paragraph-picture-paragraph-picture, I would have four pictures horizontally next to each other. Underneath this, I would have four different paragraphs: one on legislation, one on biometric scanners, one on encryption and one on forensic computing. The writing and pictures would be quite small, but you can make them larger by clicking on them. That way the pictures would be very large and effective, and the short paragraphs would be easier to read. I would end with a short conclusion, which would hopefully be effective, and with another colourful picture. I made this plan, and then considered which website I could best use to create this. There were three to choose from: smore, slides and Prezi. At first, I decided to try out slides. I wrote a few paragraphs in it. However, I wasn't especially pleased with how it looked. It was very hard to insert pictures, change the font and design and make it look attractive. It looked more like a PowerPoint slide a younger child would make than a professional flyer. I decided that this website certainly wouldn't be the one I'd use. Personally, I wouldn't read something set out and written in this format. I then considered Prezi and Smore. Out of the two, I thought Smore looked more professional. It had a range of designs, it let you write as much as you wanted and there were a large range of things (such as buttons, links, ect.) that you could add on here. Prezi was easier, but wouldn't let you do some of the more complex things I wanted to do. Flyer was also the best form to print a document in, which many children might need to do. When making my flyer, I discovered I didn't always stick to the plan; I'm going to explain what I changed, and why. I added, as well as an introduction, a bio that was only a sentence or two long. This almost took the place of a short introduction, saying briefly why I was here. A small, bright picture went with it to make it more interesting and would catch a younger person's eye. The fact that I already had a quick introduction enabled me to go into more detail in the "official" introduction. I could explain why what I was talking about was important, which I certainly needed to do, having already grabbed their attention with a short paragraph. I ended up putting slightly more detail into the two lists than I had planned to. The fact that they were still in list format made them readable, but they were more informative with the extra detail coming after the main bullet points. I decided to split up the next section slightly differently. I started with giving a few tips on how to stay safe online, and then told them what to avoid. In this way, the "what to avoid" section (mentioning a few online crimes) would lead them up to the story, and then I would give them a real example to shock them into really absorbing what they had just read. This was a more effective way of doing it than what I had originally planned. I followed my plan with the privacy settings and the screenshot. Next, I tried to vary the format. It would allow you a maximum of three pictures in a row, so I inserted the first three, with the writing underneath as planned. The next one had slightly less information, anyway, and was written slightly differently, so it worked out best in this way. Also, four columns would have been very closely squashed together, which may have made it hard to read, especially for younger children. I followed my plan with the information about internet addiction. I then added in another, unplanned section about a survey I had completed. A short section near the end of this flyer details why I thought that adding this would be effective and a good idea. It was also the reason I didn't end it with a conclusion. I thought that a "say", in a way, from several teenagers-- with what I had gathered from that-- would be a thoughtful way to end a presentation, and would make it more real. I didn't think a conclusion could improve on this. This screenshot shows the instructions for what I had to do to create the flyer I wanted. I had to read through these carefully, and then follow the instructions to go about it. I had to decide how to word my searches for each section, copy and paste them into my research document, distill the information and create a flyer showing what I had learned. 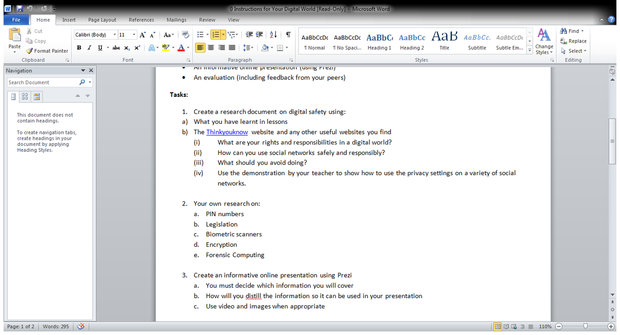 I started this process with creating the research document. I had a list of various things to research on a document that my IT teacher had created. This inculded things such as rights and responsibilities. I needed type this into google to discover what connected results it would have. I didn't directly type this in, but decided what I thought would be effective. For example, when it said I had to include research on pin numbers, I typed "how to keep PIN numbers secure". This would give me relevant information, rather than random information about PIN numbers in general, which wasn't what I wanted. This website came up: http://en.wikipedia.org/wiki/Personal_identification_number Wikipedia articles are always very longwinded, and this one was too. It took a while even to scan all the information. 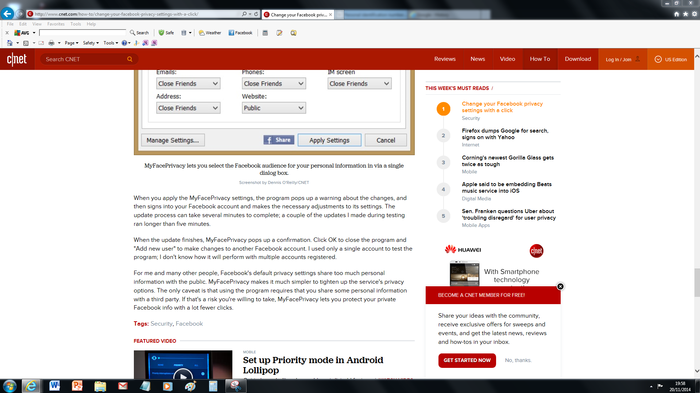 However, the screenshot above shows the relevant section. Even cut down simply to here, I didn't need everything. But I still copied and pasted into the research document. I did the same for every other website I visited. Here are some examples of a few other websites. I discovered this section through searching for "online safety". That is one very open search where you know that a huge number of results can come up. I knew that many websites would be irrelevant, but also that I might get some new, interesting sites that I wouldn't have discovered only searching for the specific tasks. You can see at a glance that this website is completely different from Wikipedia. It is less descriptive, less longwinded and less formal. However, in a completely different way, I found it just as useful. It was almost easier to use. 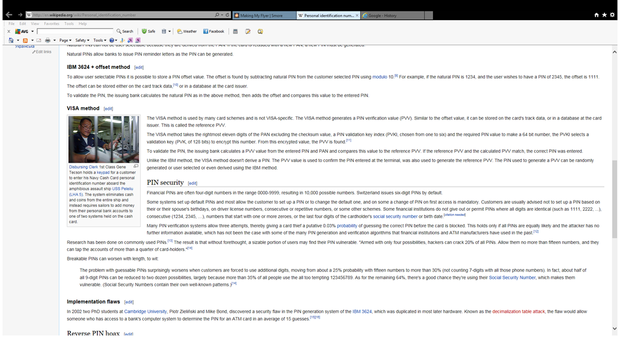 With Wikipedia, I copied and pasted a big section, and then highlighted the essential facts and deleted the unneeded information. That took a great deal of work. With this, I simply had to copy and paste the bullet pointed list, and there it was, ready to be used! It provided several pieces of information that could be put under the "responsibilities" heading. I'm not on Facebook, but the way to get information about this section was to search "steps on how to change Facebook settings". This website was for Facebook users, but was still a great deal of use for me; it provided me with all of the information I needed to know. It had a step-by-step guide and several screenshots. I saved a screenshot to my computer to illustrate my flyer and make the point clearer. I also copied and pasted the whole guide, only deleting a couple of irrelevant steps. I still had some information I wouldn't use, but I wanted it there in front of me to pick and chose from when I was working on the actual flyer. This had quite a lot of information to read through, but it was very useful because it was all to the point. It was also here that I took note of a point I will explain shortly. 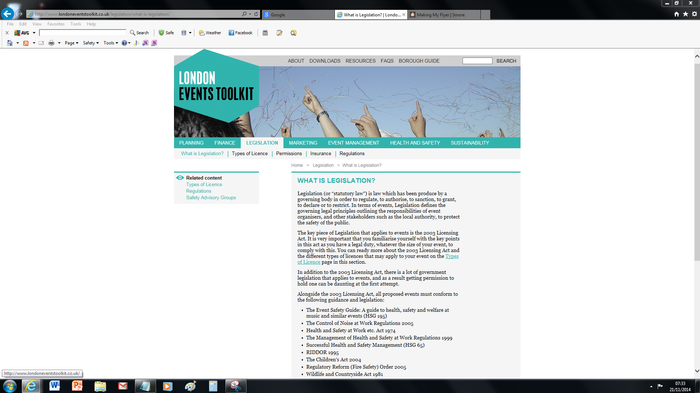 This website I found by simply searching for "what is legislation". It didn't have anything to do with the internet or how it applied. It wasn't exactly the information I needed, though, since it was quite longwinded, there was a lot of information there! However, as always, I skim-read it. I then copied and pasted most of it, deciding, as always, to go through afterwards to delete what was unnecessary. Due to the long words and formal way of putting things it wasn't the easiest thing to read through, but after studying it, highlighting some areas and deleting others, I had a fairly good grasp of what legislation was. But it still wasn't completely relevant to my flyer. 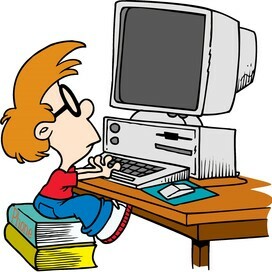 What I needed to do was to apply the knowledge of legislation to my knowledge of computers and the internet. How did they fit together? Why was this relevant for a flyer on internet safety? I worked this out, and was then able to use this in relation to internet safety when I transferred the knowledge to my flyer. I did all this as I was going along, for each of the different topics. Sometimes I would quickly check out a fact on another website and forget to add the link, but all of the main websites I used have been linked to. Once it was done, I still had a huge amount of information, so I went through it. I split the whole document into three categories. What was irrelevant- I knew that I didn't need some things, so I went through and deleted them. What I might need- If there was something that I thought had useful potential- a story or a statistic, for example- I would keep it. What was needed- Anything that I thought would be vital, I highlighted carefully so that I would see it later. It was then time to create my flyer. To do this, I had to create a Smore account. I'd never had one before and never used Smore before, so it took a little bit of time to get used to. After fiddling around a bit, I created a flyer draft. I had to think about the layout when I was doing it. At first, I went for a "modern" template, thinking that the technology fitted in with the theme. However, I changed it after a while to a "handwritten" one. This looked less technical, but was also brighter and more eye-catching. I certainly wanted to make it eye-catching and grabbing. This help if it was for a slightly younger audience; they might be put off if it looked too boring or difficult. This was a nice way of presenting the information. I also added in a few pictures. They were for the same reason, since I rarely used actual graphs or screenshots. It just looked a lot nicer and more eye-catching if there were some brightly coloured pictures, rather than just a long strong of words. Wikipedia, for instance, was one of the less useful websites; it contained a lot of helpful information, but it wasn't set out in a very fun way, which made it hard to read through properly. I wanted to make my flyer accessible for younger children. Comparing them, you can see your eye is caught by the bright, colourful one in the middle, with the added pictures, before this plainer one. (This one, being just an informative flyer to document my process, didn't need have all the attention put on the design, though I still hope it looks effective.) I then started to transfer the information. I cut it down even more than I thought, changing, deleting, even making additions. This was all a part of the process. I realised as I was starting that I didn't have nearly as much time as I'd expected to have. However, I could deal with that, as long as I planned the timing and made sure I worked hard. I typed faster than before, and left out some more. In time, it was finished. I wasn't entirely happy with the standards (there were too many short, bullet-pointed lists and not enough real paragraphs of explanation) but there was some time left! I was able to go back, make changes and add information to make it as high-quality as I could in the remaining time. One of the features my flyer needed was the survey results for 104 teenagers. This was first-hand information, and therefore more reliable than what I had discovered online. It would also make it more real for the readers, and it provided views from the teenagers themselves. Most of the work here had been done for me, so it wasn't too hard. I just had to complete the survey seven times, which I did, and hand it in on time. This would enable the teacher to complete the PowerPoint. Unfortunately only half the class finished it, but we still had a large set of results. The teacher merged all the results together. I accessed this PowerPoint and wrote them down. When the results were very extended, I copied and pasted a screenshot. I then inserted this. This was a valuable and useful part of research, so it was good to include. Karolina: I think that this powerpoint is very interesting and fun. However, there's a bit too much writing. It would be easier to get into if there was a bit less. My response: I have tried to be selective with my information. If there's still too much, I'll try to balance it by adding more pictures. If there's more pictures, the writing should be easier to digest. They will give people a break, and (hopefully) stop the many paragraphs from being boring. Felicity: Very colourful and interesting. One thing I would change would be to give it a proper conclusion. It ends quite abruptly. I think that this is okay, but it would be even better if you could summarise it briefly in one final paragraph. My response: I originally planned to write a conclusion, but decided that the survey results were a good enough conclusion in themselves. If it's someone else's opinion that it would look better with a proper conclusion, I'll try to add one and see how it looks. I have now added a conclusion. It is very short, since I have already said almost everything I need to say. However, it briefly sums up the objective of this powerpoint, as well as giving the reader something to think about. This way, it will leave more of an impression than it would have done if I had left it as before. I'm glad you enjoyed the colour (that was one of the things I worked on to try to add interest), and thank you for the constructive feedback! Eleanor: It's very well presented-- nice format, neat with well-placed pictures and textbooks; feels very professional. You've done loads of work in the time given. My response: I spent a lot of time on the format, so I'm glad it looks good (although I hope it looks child-friendly as well as professional). I've put quite a lot of hard work in, but added pictures so it isn't too hard or intimidating to read through. After I had finished, it was time to look at my flyer and evaluate what I've done. Did it do what I'd planned to do from the start? I'd explained all of the changes I had made from the original plan, and I think that all of these changes were for the better. So how did the flyer look when it was done? What gone well, and what could have gone better? I think that the introduction was effective, since it was short, but it said everything that needed to be said. The pictures at the start would also grab someone's attention, and they looked good. The section on rights and responsibilities was longer, but it was fairly interesting to read. That part had gone well. The next section, reading it through, I wasn't 100% happy with. I thought that, reading it through, the mixture of lists and stories sounded a bit choppy and changing. This meant that it wasn't quite so attention-holding or effective to read through. However, it was fairly interesting. It did, through all of this, get the point across quite well. Next time I would ensure that my writing flowed well and that it all fitted together. This would be one thing I could do to make sure that my flyer was better. I thought that the way I had formatted the next section (on legislation, biometric scanners, ect.) worked well. It was interesting-- much more interesting than keeping the paragraphs and formatting the same throughout. Hopefully, this would make sure that someone's attention was held. The next section was definately an interesting addition-- it was something more different, that you wouldn't find in every presentation. These are the links to the different websites I have used when creating my flyer.